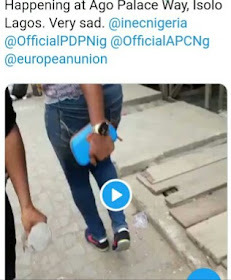 won in last election due to high population of Igbo voters in Lagos are said to be under attack by APC thugs; from Ago Palace Way to Isolo, Amowu, Ajeromi, etc. The thugs are chasing people away, burning already tumb-printed ballot papers and there is no Police or Army to "shoot at sight". A lady shared the disturbing clip where someone was shouting "this country is something else, they just burnt our votes". This is even as innocent Nigerians were on the run, fleeing from the rampaging political thugs.